Lacock is a village in Wiltshire, 3 miles from the town of Chippenham. 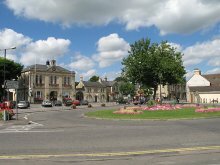 The village is owned almost in its entirety by the National Trust, and attracts many visitors by virtue of its unspoiled appearance. Most of the houses are 18th century or earlier in construction. There is a 14th century tithe barn, a medieval church, and an inn dating from the 15th century and an 18th century lock-up. 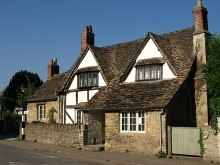 The history of Lacock Village is very much linked to that of the Abbey. 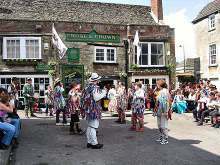 The village dates back to the 13th century. Lacock developed a thriving wool industry during the Middle Ages. Together with the Abbey, the village was given to the National Trust in 1944 by Matilda Talbot. It was a clear day in the early summer of 1925 as Sqn. Ldr. Insall sat at the controls of his Sopwith Snipe and watched the countryside slip past below him. The experienced flyer, who had been awarded the Victoria Cross for his gallantry in the Great War, was familiar with the gentle rolling farmland and as he approached the vast 520 metre circle of the Neolithic earthworks at Durrington Walls, he casually glanced at the recently ploughed remains of several disc barrows which had been almost obliterated by decades of farming. One particular barrow in Dough Covert caught his eye as it appeared to differ from the others because he could make out a number of white spots or holes inside the circle. He glanced to the west and, noticing the resemblance of Stonehenge, visible two miles away, to that of the barrow below him, he immeditely decided to pay close attention to this peculiarity on all his future flights over the area. The days lengthened into summer and by June the darker patches of the crop marks confirmed the presence of an earlier soil disturbance undetectable from ground level. This was obviously worthy of further investigation, especially as the Squadron Leader's subsequent aerial photography showed that there were indeed circles of holes or pits in the chalk. Excavations were carried out over the following three years by the Wiltshire archaeological team of Mr and Mrs B H Cunnington and, by 1928, a clearer picture of what was there began to emerge. The site was very similar to that of Stonehenge, as the astute Insall had already observed, in that it was slightly oval configuration with its axis approximately in line with Midsummer sunrise. It consisted of an outer ditch and bank some 76 metre (250 feet) in diameter enclosing several concentric circles of holes, originally intended for timber posts long since disappeared. Unlike Stonehenge, there was no central alter stone although this particular circle had a much more macabre centerpiece. One and a half metres from the actual centre, the skeleton of a child of about three years of age was exhumed from the chalk, its skull cleaved open in what was almost a predetermined act. This according to experts, is one of the very few pieces of evidence of human sacrifice in prehistoric Britain. Further investigation showed that the monument, dated at 2300BC, was older than parts of the Stonehenge complex. For the want of a better name the investigators christened the new discovery 'Woodhenge', as this title seemed so appropriate it was adopted permanently. "Lot 15. Stonehenge with about 30 acres, 2 rods, 37 perches of adjoining downland"
It was to be the first and last occasion on which the monument would be up for auction, although in 1901 an earlier Antrobus, Sir Edmund, had offered it to the Government for £50,000, an offer that was rejected. The new owner was Mr. Cecil Chubb of Bemerton Lodge, near Salisbury. Although now a wealthy man, he was of humble origin. He was born on March 14th 1876 in Shrewton, a village four miles west of Stonehenge, where his father was the village saddler. He learned his "3 Rs" (Reading Writing and Arithmetic) at the village school and continued his education at Bishop Wordworth's School in Salisbury. After a brief period as a student teacher at that school he went to Christ's College in Cambridge and took a double first in Science and Law, leaving with Master of Arts and Bachelor of Law degrees. In 1902 he married Mary Finch whose uncle, Dr Corbin Finch, owned Fisherton House Asylum in Salisbury, now the Old Manor Hospital. Cecil Chubb became the proprietor of the Asylum and widened his interest to become a successful racehorse owner and breeder of Shorthorn cattle. It was his interest in Stonehenge as a local boy that led him to attend the sale. He had no intention of bidding "but while I was in the room I thought a Salisbury man ought to buy it and that is how it was done". He remained its owner for three years and then, on October the 26th 1918, he formally handed it over to Sir Alfred Mond the First Commissioner of Works, who received it as a gift on behalf of the nation. In handing it over Cecil Chubb made two conditions. One was that the gate money, about £360 a year, should go to the Red Cross for the rest of the war. The second was that there should be free admission during normal opening hours for the residents of Shrewton (his native parish), Netheravon (his father's birthplace), Durrington (whence his mother came) and Amesbury in which parish Stonehenge stands. This privilege was later widened to include all the parishes of the former Amesbury Rural District and still in force today. It shows we are eating well. God's truely good to us. The town of Port Talbot in South Wales was a small port originally called Aberafan which belonged to the medieval Lords of Afan. The town however got its name from the rich Talbot Family who were the patrons of Margam Abbey. Christopher Rice Mansel Talbot was a wealthy landowner and a Liberal Member of Parliament. The interesting fact is that these Talbot's were related to the Fox Talbot family at Lacock - 'Talbot Village' just does not sound as nice as Lacock, so we should be thankful that he stuck to photography as a hobby perhaps and not the iron industry. On friday afternoon Queen Elizabeth the Queen Mother drove over from Spye Park, where she was staying with Captain Frank and Lady Avice Spicer, to the 700 year old Lacock Abbey and medieval village. She was received by Miss MT Talbot. Her Majesty, wearing a grey costume under a grey-blue check coat was seated beside Capt Spicer as he drove slowly through the village, to the delight of the villagers. The schoolchildren had been allowed out of school early, and as the car entered the street they were lined up. When the car proceeded towards the church they broke ranks and followed it to the church. The Royal visitor was shown around the 14th Century church by the vicar, The Rev J Frith. Her instinctive comment was:'What a lovely church', and she particularly admired the Lady Chapel, which contains some beautiful old stained glass. She also noticed a very fine 15th Century chalice. Before leaving the church she signed the visitors book. The Magna Carta was kept in the strongroom just off the blue parlour in the Abbey Tower.It was a single sheet of parchment 191/2 inches by 121/2 inches, closely,but exquisitely written, so that it is, even today, quite legible, andthe letters are beautifully formed. The Great Seal of Henry III shows, on one side, the king seated on his throne, and on the other side he is on horseback; it is of dark green wax and complete except for part of the edge being broken away. A piece of green silk cord is attached to the seal, and there is also a thin silk bag, now in two parts, in which it was formerly kept.It is marvellous to that it has survived over 700 years. It is now housed in the British Museum, but a copy of it, which was presented to Matilda Talbot, is held within the Abbey for the public to see. Lackham's History. During the last war Lackham House was commandeered by the United States Army, becoming General George Smith Patton's (Who always carried a pearl handled revolver) Headquarters. Supposedly the current library and the librarians office were his private room and bathroom. After D-Day and Patton vacating the house it became a rehab centre for wounded service personnel. After the war it became what it is today an agricultural training college. Sir Robert Peel was born on the 5 February 1788 in Bury, Lancashire. He died on the 2nd July 1850 after falling from his horse at Whitehall Gardens, London, close to Constitution Hill. His nickname was 'Orange Peel' and he founded the Peace Preservation Police, now the current day Police Force. Originally members of the Police Force were known as either Peelers or Bobbies after Sir Robert Peel. Today they are referred to however as 'The Old Bill'. 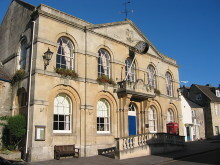 What is not commonly known is that Sir Robert Peel was also the Member of Parliament for Chippenham in 1812.